Save at least $131 on what it would cost to buy the different parts of the package separately! This combo ticket gives you 4 fabulous days of New York fun including hours of double-decker sightseeing, an exciting Hop-on, Hop-off Ferry, museum admission, shopping and other thrilling attractions. And it's fantastic value! No fewer than 96 hrs of sightseeing on four bus tours are included in this package. 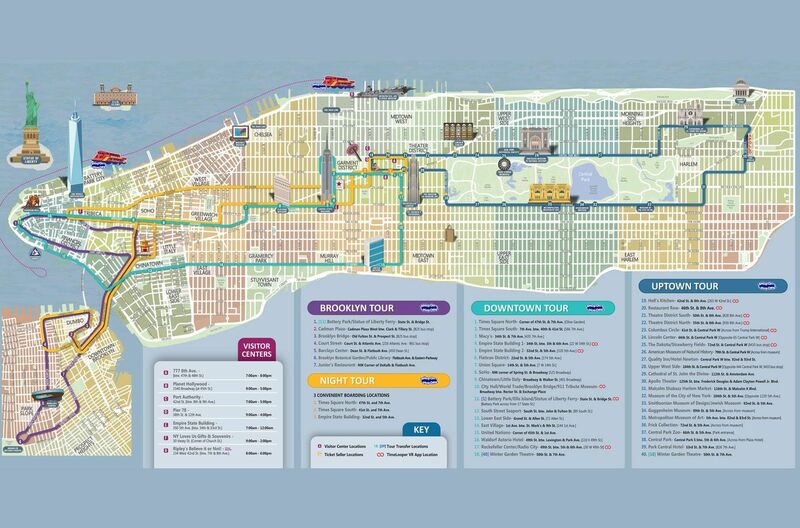 There are 4 hop-on, hop-off routes (Downtown, Uptown and Brooklyn Tour) You can also see the city sparkle at night on an escorted Night Tour. The attractions element of the combo provides you with a choice of ticket to the Top of the Rock Observatory or the Empire State Building. Plus, you can visit the Museum of the City of New York OR New York Historical Society. That's not all! you will also get round-trip bus ride to Woodbury Common's Premium Outlets. While on the bus, an English-speaking official New York tour guide will ensure you don’t miss a thing. Recorded commentary in choice of 11 languages is also included. The recorded tour content and narration is enhanced with music and sound effects, mimicking the street sounds of NYC. A trip to NYC would not be complete without some retail therapy! Your combo ticket provides for this with a return bus trip to the world’s largest collection of designer outlets at Woodbury Common Premium Outlets. Ticket is valid for 96 hours from the time the ticket is issued. The fantastic value tour includes 96 hours of double decker sightseeing, attractions and more! The bus tours include the Hop-On, Hop-Off Tour and Night Tour. Attractions include free admission to the Museum of the City of New York, a Hop-on, Hop-off Ferry, entrance to an observation deck at the Empire State Building or Top of the Rock Observatory, and roundtrip bus ride to Woodbury Common Premium Outlets®. Woodbury Common Premium Outlets: With 220 stores, Woodbury Common Premium Outlets is the world’s largest collection of designer outlets. You’ll find impressive savings of 25 per cent to 65 per cent every day from leading designers and name brands including Balenciaga, Burberry, Chanel, Coach, Chloe, Dolce & Gabbana, Etro, Fendi, Gap Outlet, Giorgio Armani, Gucci, J.Crew/Crewcuts, Jimmy Choo, Lacoste, Neiman Marcus Last Call, Polo Ralph Lauren, Prada, Saks Fifth Avenue Off 5th, Tod’s, Tory Burch and Zegna. You can choose between the Top of the Rock observation deck or the Empire State Building observation deck at the NY visitor center when exchanging your voucher for tickets. The Empire State Building: It is currently the 9th tallest building in the world and the 4th tallest freestanding structure in the Americas.. This NY monument has 102 stories, and was the first building to every have more than 100 stories. Top of the Rock Observatory Tickets: Discover Top of the Rock Observation Deck and experience breathtaking views of New York City. Step on one of their glass ceiling sky shuttles for a thrilling ride to the Top, where you will find three stories of spectacular views, including a stunning, open air, 360-degree panorama from the 70th Floor outdoor deck. You will also get a Eat and Play Card that offers a fantastic range of savings at Manhattan’s best-loved restaurants, shops and attractions. You will be able to choose between the Top of the Rock observation deck or the Empire State Building observation deck at the Gray Line CitySightseeing New York Visitor Centre when exchanging your voucher for the tickets. Tickets for Top of the Rock Observation Deck or Empire State Building, New York Historical Society or Museum of the City of New York and City Sightseeing Hop-on, Hop-off Ferry are valid as indicated on ticket stub. Woodbury Common Premium Outlets is open 7 days a week, all year with the exception of Thanksgiving and Christmas. The center offers shopping amenities such as gift cards, locker and stroller rentals, wheelchairs, foreign currency exchange and ATMs. A restaurant, centralized Food Court and additional eateries are available on-site.Buses are wheelchairs accessible. Double-decker buses with lower level seating are marked with the symbol and disabled customers can board them at any of our stops. These buses have ramps and securement for two wheelchairs on the lower level. Great value for money, the shopping trip was great !